Afraid of other people snooping around on your computer while you’re gone? Too lazy to manually lock and unlock your computer, when you just want to get a coffee or have to use the rest-rooms? Read on! Often company procedures and internal IT security guidelines require you to lock your computer whenever you leave your desk. But most of the time you’re just going to grab a cup of coffee and you’d be back within a few seconds. Your colleague spots you in the hallway and you get into a conversation and without realizing 10 to 15 minutes have passed. Suddenly you remember that your computer is still unlocked and has been for the past 15 minutes. What if something happened? What if someone accessed data they weren’t supposed to get access to? By now you probably really regret not having locked your computer. Relax – now there’s a little helper for you! 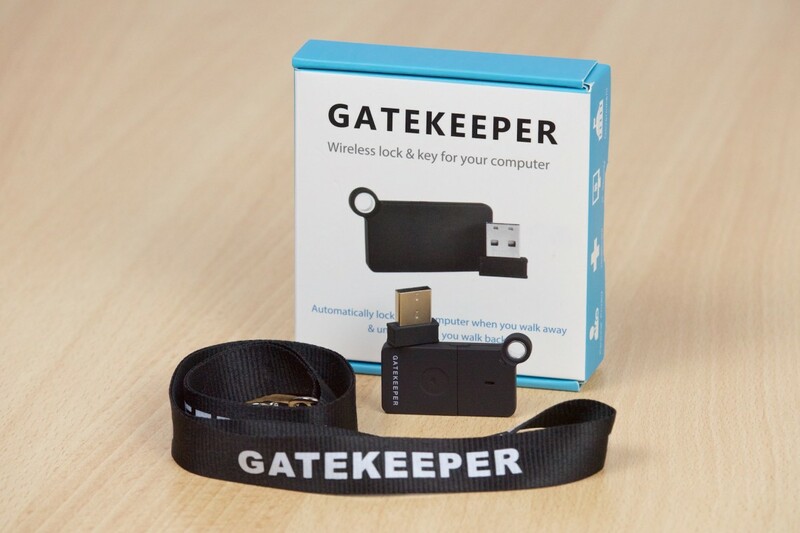 The GateKeeper 2.0 from gkchain.com is an interesting little device. Basically, it lets you automatically lock and unlock your computer screen whenever you go away from it. The mechanism consists of two parts: the USB module (similar to bluetooth and wireless mouse adapters) and the GateKeeper keychain module (powered by a CR2032 battery). With the software installed and the USB plug connected, you can set the maximum distance where the computer remains unlocked. Whenever the keychain module is taken away, outside of this radius, the computer is being blocked by a full-screen logo of the GateKeeper. While the USB connector glitched on me a few times when I configured it the first time, it would work properly and reliably once it was setup. The user interface of the configuration application is well designed and easy to understand, but nothing fancy in terms of design awards – just well functional. I tested it on Mac OS X 10.11.4 „El Capitan“, but it is also compatible with Windows, including Windows 10. For more information please visit their website and feel free to comment on my video. If you enjoy my content, please consider liking the video and subscribing to my channel.